The Rhone Valley is arguably one of the most diverse regions in France, if not Europe. Covering over 200 km from north to south it is one of the longest regions, and with the difference in climate and soil conditions provides many opportunities for viticulture. The region is split from Valence, about 100km north of Avignon and 100 km south of Lyon. North of Valence has a much more continental climate, cooler and well protected from winds and rain. 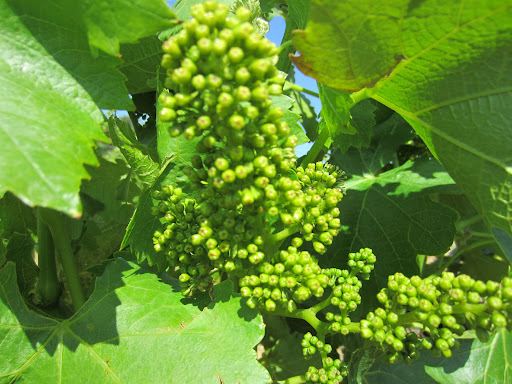 South of Valence is more Mediterranean in climate, warmer with more wind influence. This is probably the most important difference between the north and south. Throughout the entire region, there are a multitude of producers of different size and style. Growers who may not make or bottle their own wine may be part of a cooperative that vinifies the fruit, and either sells the wine in bulk or bottle. There are more artisan producers who only produce wine from their own estates, whether in a single appellation or several. Then there are those in between, who produce wine from their own estates, and also purchase fruit and/or wine from growers to produce/bottle under their own label. It is very common for producers in the Northern Rhone Valley to operate in this model, as in the north there are not enough vineyards and they are also very expensive to purchase and manage, and so they compensate by bottling wine from the south were fruit is less expensive and in much larger supply. In several cases a Cotes-du-Rhone Rouge wine may account for 50% of the bottles sold each year. The first appointment for my third day epitomises this model (Guigal), the second has only just started to move into this realm (Chateau Font de Michelle), and the third only produces wine from their own estates across three appelations/vineyards (Domaine de la Renjarde/Le Prieure de Montezargues). As it was the only appointment time I could get, I had to drive north for over an hour to make it to Guigal in Ampuis, which is the heart of the Cote Rotie appellation, the most northern in the Rhone Valley. Not for the first time on my trip I discovered that I was joining a public tour, which I don’t really have a problem with per se, as long as I am informed about it beforehand. It is a little bit limiting, as the host isn’t a winemaker or commercial manager, and thus isn’t always able to provide the clearest of pictures about the production or the terroir. I also don’t like to ask too many technical questions, as it will possibly confuse the other visitors and require further explanations that aren’t relevant and take up more time. The other problem is that I can’t press the fast-forward button through areas and topics that I am very familiar with, and get down to the specifics of the estate. After eight months I have seen at least 200 wineries, so rarely do I see anything new. That was until I saw the packaging line at Guigal, which is the most sophisticated I have ever seen (including some of the lines in Champagne), and more than capable of handling the 6,000,000 bottles they produce each year. The most amazing thing was probably the machines that box the wine, from placing the dividers in the box, placing the bottles inside, and then sealing them up. After opening hundreds of boxes of the Cotes-du-Rhone Rouge that I sold back at home, I now understand why it has such a unique carton, as it is all automated. The tour of Guigal is run very well, and the other four guests on the tour were two couples from the USA who were very receptive not only to the tour, but also about my story. For all intents and purposes, Guigal is the Rhone Valley. No other producer has done more to promote the entire region in as many markets as Guigal, and no one produces as many bottles in every appellation in the Valley. Whilst the heart of the estate is in the North, most importantly in Cote Rotie, the majority of the wine is made from the Southern Rhone Valley, with 50% of bottling to one wine (Cotes-du-Rhone). The Guigal range is more than the envy of the Rhone Valley, it is the envy of all French producers, as they have an exceptional range of everyday wines which all represent value for money, as well as their icon wines which are amongst the best in the world. The Cote-Rotie wines in particular are some of the most famous and sought after in the world, and today fetch prices similar to the more fabled Bordeaux and Burgundy appelations. Producing 6,000,000 bottles of wine each year that are all of a high quality is no mean feat, and requires two important things when buying wine for bottling. The first is having access to high quality wines, which isn’t a problem considering the reputation Guigal has, and the winery receives hundreds of submissions each vintage. The second thing is a very good selection process, which again Guigal manages with their winemaking team, who ensure that the best wines are purchased and received, and the rest are rejected. The winemaking team then need to determine the blends of each wine based on the submissions, which also include wine and fruit from Northern Rhone vineyards not owned by the winery. The top wines from the north all come from single vineyards owned by the company, and on top of the heap are the three single vineyard Cote-Rotie wines; La Turque, La Landonne and La Mouline. Click here to read my notes on the tasting I shared at Guigal. One of my best resources for selecting wines to contact has been the very informative Wine Doctor website, written by Chris Kissack. He regularly updates the page with tastings and profiles, but the most useful information for me has been the producer profiles and country/region guides. Through this I have found many wonderful producers to contact in France and Germany in particular, and also confirm that wineries I was already familiar with were indeed solid producers. It was here I came across Domaine Font de Michelle, a relatively small producer in Chateauneuf-du-Pape that has a solid and shared history with Vieux-Telegraphe, as well as neighbouring vineyards. The Gonnet family are cousins to the Brunier family who own Domaine de Vieux-Telegraphe , and the Font de Michelle winery began its history in , located on the actual Fontaine de Michelle which is a hidden spring. 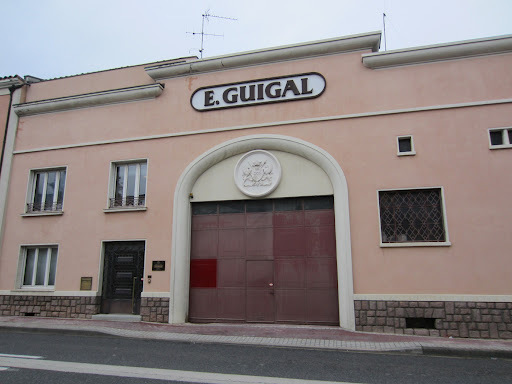 The cellars are located the other side of the Motorway from Vieux-Telegraphe, and it is here that I met fourth generation oenologist Guillame Gonnet. Much like Bastien Tardieu, he worked vintages in Australia when he was younger, as well as in California and South America. His connection to Australia is significantly stronger though, as he is now married to an Australian that he met when he lived in Sydney, and they recently had a child that they speak to in a mixture of French and English. They have plans to spend some of their time in Australia, where Guillame intends to make some wine in the Barossa Valley, the perfect place for red wines he is very familiar with. 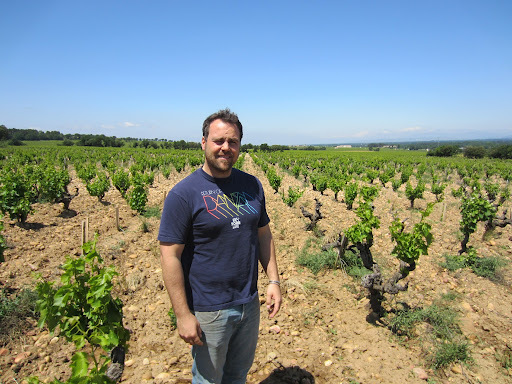 Guillame was one of the few people who have hosted me on my trip that understand my desire to better understand the terroir and vineyards that I am visiting, rather than just a winery which with all due respect, are mostly the same. We drove through the vineyard which is closest to the winery and the largest, which is located on the south-eastern side of Chateauneuf-du-Pape. In this vineyard there are big differences in soil types from one parcel to another, and thus different varieties of white and red are planted (mostly field-blends) to best capitalise on these differences. The viticulture is organic with leanings towards biodynamic, but the preference is to retain a little flexibility to be able to prevent the inevitable when it comes to disease or damage to the fruit. 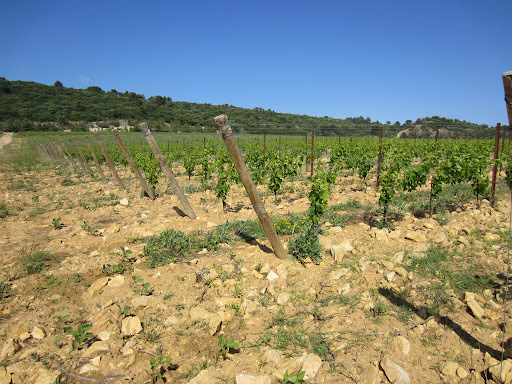 As mentioned there are also vineyards that neighbour Vieux-Telegraphe on Le Crau, the plateau of the appellation, where there are more of the rounded alluvial white stones on the top soil. 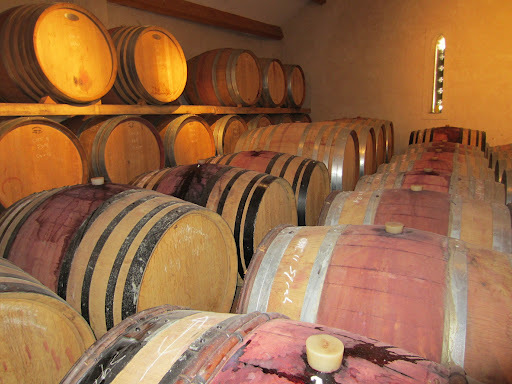 Generally parcels of fruit and not necessarily single varieties are fermented and macerated together, and then the selection process determines whether all three levels of Chateauneuf-du-Pape are produced each year. The philosophy of winemaking is right up my alley; hands-off minimalist vinification with only natural filtration and small amounts of sulphur only at bottling. 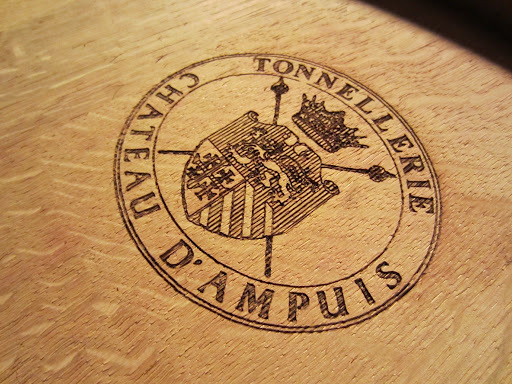 The winery is now starting to produce some wines from outside of the Chateauneuf appellation, and is buying wine from growers to mature and bottle at the cellars. The tasting took me through several appelations and vintages, and you can read my notes here. As if it wasn’t enough that I got an amazingly personalised visit at Chateau La Nerthe, including a trip to the key vineyards and lunch with Christophe, he then offered to take me to the other two estates owned by the Richard family that he also is responsible. I returned in my Smart car to the CT9 estate, and we jumped into the car heading east. This took us to the Domaine de la Renjarde (not easy to pronounce), which is in the Cotes-du-Rhone Village appellation of Massif d’Uchaux. This is actually where the family started from, and they purchased the La Nerthe estate afterwards. In this part of the Rhone valley the norm is for growers to sell their fruit or wine either to cooperatives or negociants. Not only do Domaine de la Renjarde vinify and bottle all their own wines, they are actually expanding the range to include a new red rose and white wine. The vineyards at this estate and the one in Tavel are currently under the process of conversion to organic viticulture, whereas the La Nerthe vineyards are already certified. This vineyard has some of the oldest vineyards in the whole Rhone valley, some of which are at least 100 years old. Granted this isn’t as old as some of the grenache and syrah vines in parts of Australia, but these areas were not affected by phylloxera as they were across Europe. 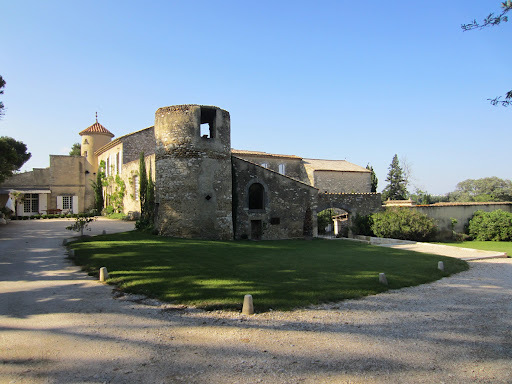 The third estate that makes up the triumvirate for the family is the Prieurie de Montezrgues, located in the Tavel appellation which is the only one in the Rhone valley dedicated to the production of rosé wine. Tavel rosé is unlike any in the world, as there is actually a minimum alcohol level; whereas most rosé wines around the world would be no more than 12%, Tavel rosé must be a minimum of 11% and is often much higher. The sugar levels at harvest are therefore higher, and to balance the alcohol and fruit of the wine requires more tannin. This is achieved through longer skin contact before (or during) the fermentation, and the resultant wine can be a little bit hard for most people to understand, but is actually a much better pairing to food than any other rosé wine. The winery is located next to a particularly important hill in Tavel, and is an important place for prayer. The cellar is part of a 14th Century monastery, where wine was previously made in a very traditional way. You can still see the remnants of their fermentation and storage practices, but of course the wine wasn’t sold or bottled. Of the few Tavel rosé wines I have had the chance to taste, I had been blown away by the texture and warmth of the wines, and found them to be a little it challenging. Whilst the Prieurie rosé is certainly more robust than those I tried in Provence, it was very well-balanced and subtle, and would make a great companion to Asian cuisine in particular. Click here to see many more photos from Day Three in the Rhone Valley, France. On Day Four I head north, and visit Cornas legend Jean-Luc Colombo.